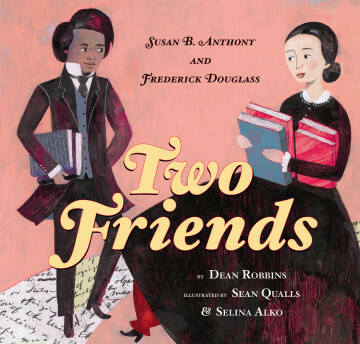 Summary: Imagine Susan B. Anthony and Frederick Douglass, both civil rights activists who lived in Rochester, New York, sitting down to tea and cake together. That’s the starting point of Two Friends, which then takes a look back at the early life of both Anthony and Douglass and how they became involved in the struggles to end slavery and give women the right to vote. An author’s note gives a bit more information, as well as dates when both goals were achieved in the United States. 32 pages; grades K-3. Pros: An interesting introduction to two important 19th century activists whose civil rights struggles are still relevant today. The colorful folk-artsy illustrations nicely portray Anthony, Douglass, and their homes in Rochester. Cons: A pretty brief introduction with only a little biographical information. I really enjoyed this book–very touching!! And the art is amazing.